Activities: Camel riding for an hour, visiting Erdenezuu temple, visiting National parks such as Khustain nuruu, Great White lake /Terkhiin Tsagaan nuur, Lake Khovsgol, enjoy natural hot spring at Tsenkher, a day hiking between the lake and Khorgo volcano, Horse trekking for 4 days, visit reindeer breeders, visiting local families. Tour price: All prices are for per person. We’ll drive to the Khustai National Park, located on the north side of the Tuul River, about a two-hour drive west of Ulaanbaatar. Although located in the central grasslands, Khustai means “with birch” because birch trees and aspen groves are plentiful in the area. It is a hilly terrain, with the Tuul River forming the southern boundary. The national park was originally set up in 1993 as a nature reserve for the first reintroduction of the Przewalski’s Horse (Equus przewalskii) into Mongolia. Today the Khustai Trust runs the park, funded mainly by tourism funds. We’ll to drive to Mount Khogno Khan Nature Reserve in the afternoon. The mountain is home to hundreds of birds, deer, and gazelle. You’ll be able to go hiking around the area or to the small sand dunes nearby called ” Elsen tasarkhai”. Spend the night in a nomadic family ger. We’ll drive to Tsenkher hot spring. You’ll be able relax taking natural hot bath in the hot spring water. Stay at ger camp at Tsenkher hot spring. We’ll drive to Great White Lake and Khorgo Volcano. Khorgo-Terkhiin Tsagaan Nuur National park was established to protect the spectacular mountain scenery and endangered species of fauna and flora. The area has extinct volcanoes, many beautiful lakes, a great number of animals and birds, and is definitely one of the best natural tourist attractions. Khorgo is a unique natural complex (2240 m), National Park surrounded by the Khangai Mountains, which is 3000 meters above the sea level. In the craters some of them are very tiny crystal- clears lakes. The Khorgo crater, situated at an altitude of 2.210 meters with a diameter of 20 meters and depth of 70 to 80 meters, is the most stunning. We’ll stay at nomadic family ger. We’ll go hiking to the Volcano “Khorgo” for a day and enjoy the beautiful scenery. We’ll drive to Murun town, a capital of Khovsgol province. Please note it involves long driving. We’ll get the border permit for visiting Reindeer tribe and then we’ll head to Reindeer tribe, but we’ll spend the night on the way. 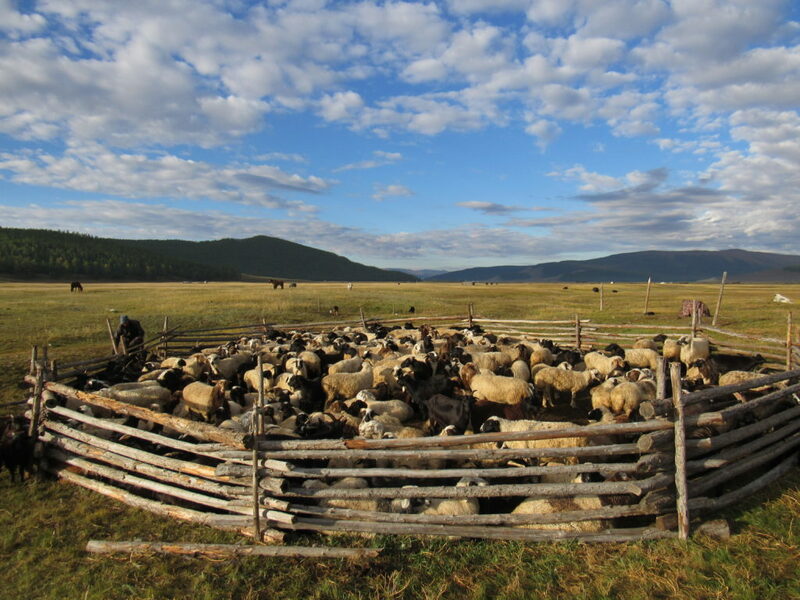 We’ll camp near Ulaan Uul village. 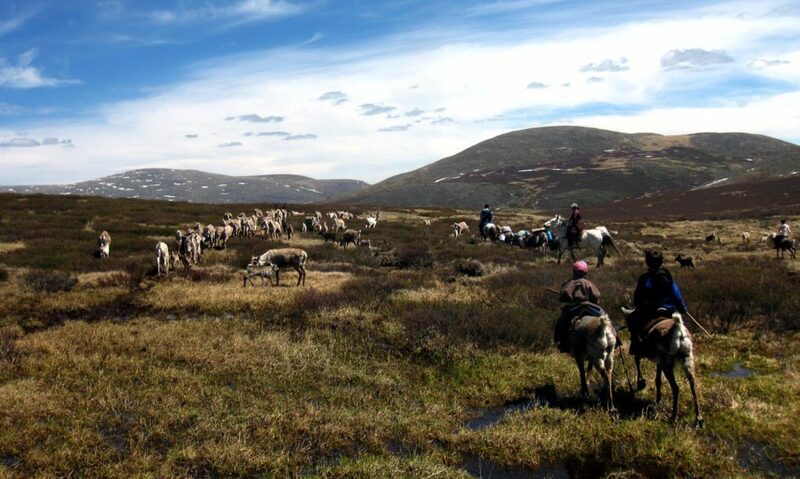 We’ll arrive at the horse herder family and enjoy the view and go hiking around the area. We’ll start the horse trekking and will ride horses for about 5-6 hours. We’ll camp. 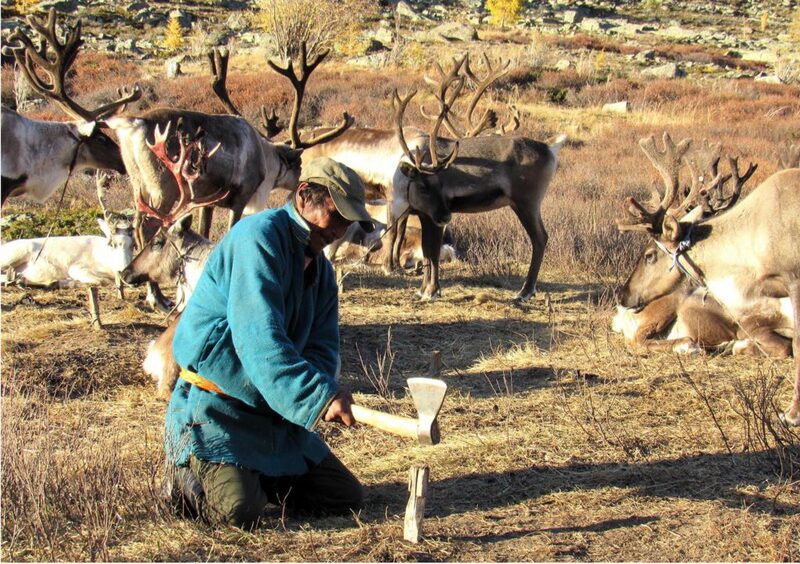 We’ll continue our horse trekking and arrive at the reindeer tribe in the afternoon. We’ll meet a reindeer family and sleep in their huts. We’ll be able to observe their life style and have some time to play with their children before noon. And then after lunch we’ll continue riding our horses. We’ll continue riding our horses for about 8 hours and back to the van. Please note: We’ll have a long driving day in order to reach the the lake Khovsgol. 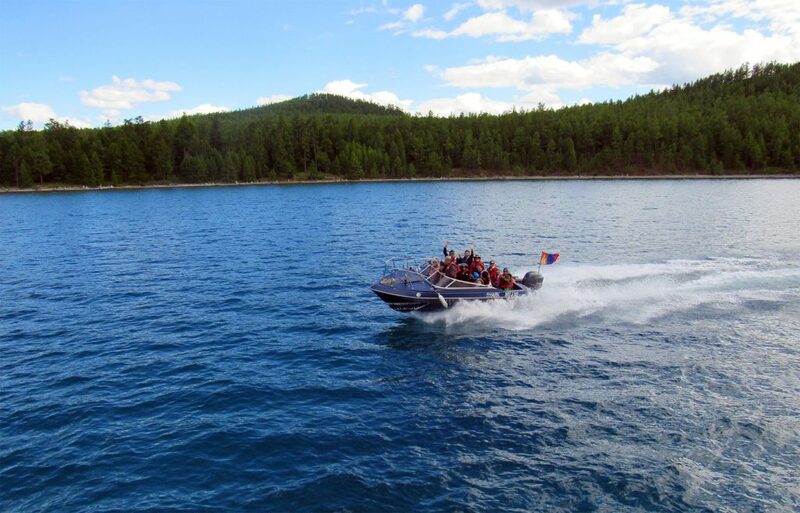 We’ll drive to the Lake Khovsgol which is one of the most visited places for both locals and tourists. We’ll go hiking around the Lake Khovsgol whichis one of the country’s largest and most spectacular protected areas. Lake Khovsgol’s 380 cubic km of water make it the fourteenth largest freshwater lake in the world and second largest in Central Asia by volume, with over 1% of the world’s fresh water. At its deepest, the lake dives 262 meters. Ninety-six rivers and strearns empty into lake, but only the Egiin River exits the lake. The Egiin flows southeast until it joins the Selenge River, which flows through one of Mongolia’s most densely populated areas on its way to Lake Baikal. The Lake is 1645 meters above sea level and is generally frozen from January until April or May. We’ll spend the night in the Guest house. We’ll go hiking around the lake and enjoy the view. We’ll drive to Uran Togoo near Bulgan province. Actualy, we’re heading to Ulaanbaatar. We’ll drive back to UB.